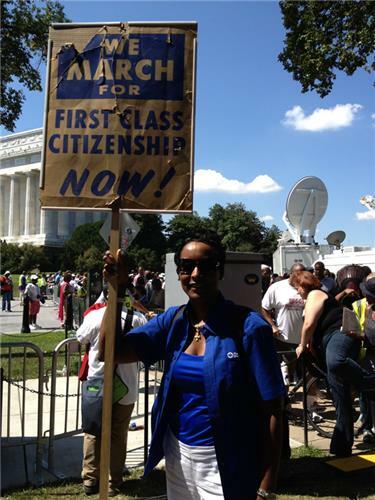 The Atlanta Journal-Constitution is in Washington, D.C. for the 50th anniversary of the March on Washington. Our reporters will share updates and photos as well as your stories. The bus rules are being read. Keep iPod music turned down. No drinking. No smoking. PG movies will be shown. Nothing illegal. 9:20 pm. The bus is moving. 2 hours and 20 minutes behind schedule. Nobody seems upset about the delay. Sounds like you guys are having an awesome trip up to DC. Wish I was with you but will be there in spirit and prayer! At 6 a.m. Saturday the lobby of the Grand Hyatt is abuzz with members of the National Urban League and the brothers of Alpha Phi Alpha fraternity wearing their black and gold tshirts. Rev. Martin Luther King Jr. Was a member of this fraternity as is my colleague Ernie Suggs. At 7 a.m., around 400 marchers gathered on H Street carrying signs, pushing strollers and some were on walkers. It clear already that today's march will include lots of wide-eyed jg abd excited young narchers. This sign is an original from the 1963 march...sue davey was here 50 years ago with this sign and now she brings it back 50 years later to share its significance. As I hold it here now I know America has come a long way.